Believe it or not, 90's comics weren't all about the latest foil covered, die-cut, poly-bagged edition of DeathDeathKill #1 - and this week I'm chucking up another of the decade's good beats; the well defined structure of the 90's X-teams. With today's news Claremont is returning to the X-Men, it seemed a perfect fit. 'They are not afraid to live in a world that hates and fears them' the old saying goes. Well good luck trying to find them these days. The line-ups of the various X-Men teams are so muddled and some characters repeatedly used, it's hard to know who is where, what the criteria is for each team and how much moolah you'll need to follow the adventures of your favourite guy or gal. But that wasn't always the way. 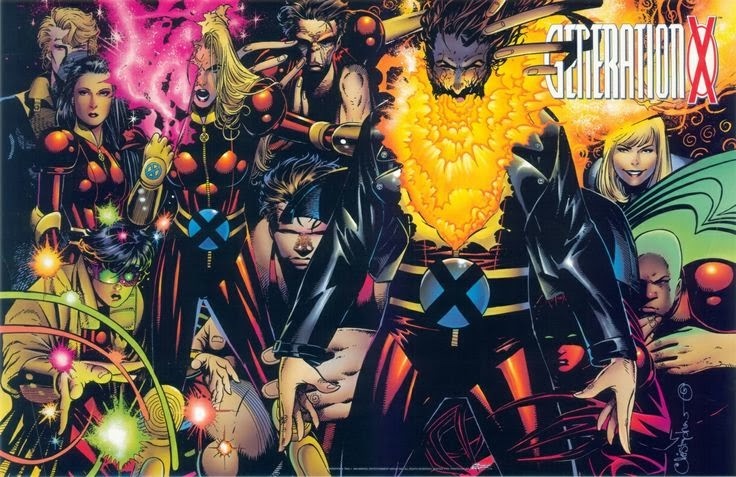 Spurred on by the sales of Spider-Man #1, Marvel's X-office underwent a massive restructure, based around the debut of Chris Claremont and Jim Lee's X-Men #1. 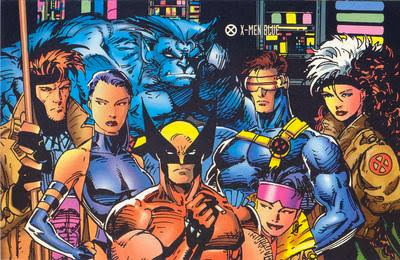 A book that would shelter the 'Blue Team' below, while the 'Gold Team' to the left ran rampant in the flagship title Uncanny X-Men. While the covert 'Mission Impossible'-ish feel to the Blue Team and members Psylocke and Beast appealed to my gut instincts, I was firmly with the Gold Team. Especially as Storm and Jean's friendship has always been the true heart of the franchise to me. But Marvel didn't stop there, nor did having the five founders ducking out stop X-Factor. The book that finally gave Havok his due, X-Factor swam rather than sank after the big-guns left, due in large part to writer Peter David using it to explore characters such as Polaris and Quicksilver in ways few had or have since. While the book would undergo one more massive roster change during the 90's, with Sabretooth, Mystique and Forge at the front, it is this line-up that served the decade best. What this founding gave the X-Fans was certainty. Sure you had floater characters between the books like Maverick, but outside these teams, you knew if the character had a militia or New Mutants tie to them, you'd find them in X-Force. 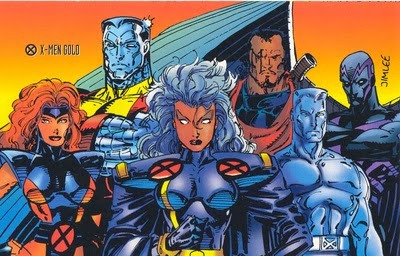 This let the writers grow territorial over developing their own characters, with such plotlines as Colossus's defection, while rowing forward as a whole with events such as Age of Apocalypse. Hey Coby - cheers for your comments! I've only just realised I forgot to mention Excalibur - but of course they had a defined quirky membership too. I think the schools are a great way to try and regain that blue / gold feeling without actually doing it, but like you say, it's hard to know who has landed where. Like Colossus for example. 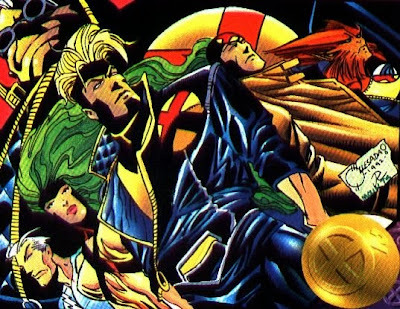 I miss the Blue and Gold X-Teams! They made the 90's such fun, not to mention the roster you'd want to put together. The Blue team was always my favorite, but then look at the names and talent they put in there. The gold team never had a shot until Bishop showed up. I wish they'd go back to this format again, which they briefly tried during Casey/Morrison's run, just not far enough. Thanks Dale! I think the other sad note of this post is looking at the Generation X poster and going 'Where are they now?'. Sure Emma went on to better things, but Banshee and Sync are dead, Jubilee's a vampire and Husk is a supporting character with Doop in the Jean Grey School. Considering Chamber alone had the personality and look of a Marvel superstar in the making, it is pretty sad stuff.